LEO privacy safeguard is the most trusted privacy maintainer for the Android devices and is extremely popular amongst the users who want to keep their phones out of reach of snoopers. It is the Application which locks certain applications by choice of the user and helps maintain the privacy of the data stored in the phone. There may be many important messages, contact numbers, images in the gallery or social networks which the user would not like to share with anyone especially the family or the prying roommates etc. The Applock provides a high level of privacy protection by providing features like hide images, hide video, hide private call logs, and hide private SMS. It gives a swipe shortcut which allows the user to easily unlock a certain app with a unique password known only to him. There is no need to keep your phone in your hands all the time as your phone carries a lot of confidential information, the LEO privacy safeguard will do the needful for you. There are several ways to disguise your apps or put a mask on the application that you want to be limited to yourself. The LEO privacy safeguard is the top 1 privacy safeguard in the Android store and has been given a high star rating by the users. It acts as a guard for the phone and keeps away the unwanted intruders to pry on your private messages, videos or call logs. It also provides the feature of uninstall or remove the unwanted applications which slow down the phone and use data unnecessarily and keeps a backup of the important Applications and helps to have the data secure and prevents the user from losing it. 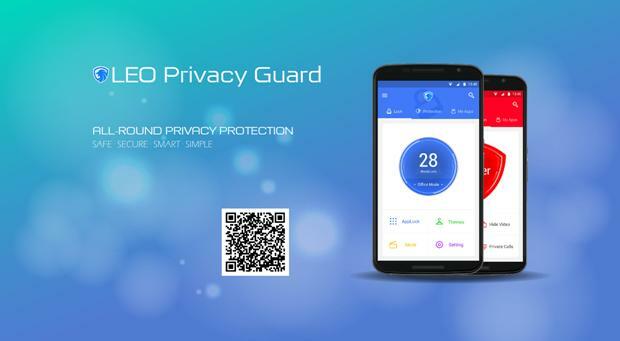 One of the most appreciated features of the LEO Privacy Safeguard is that it keeps the data plan and the usage of battery under control very easily. The safeguard provides the user the best user interface designs which are very simple to use, spontaneous and convenient. The various patterns for the lock screen also have very stylish designs. It has a more compact package of software which will eliminate any complex procedures and gives the user the manageable software. The Privacy safeguard has an optimised unlocking interface screen which will completely hide the unlocking patterns and easily keeps the users privacy. The user gets a different visual experience with the smooth animations and more sensitive interface which have been developed by the Android Developers over the period of time improvising the app pertaining to the various suggestions provided by the users. The other best features of the LEO privacy safeguard include the different ways to unlock your secrets in the form of Touch Id, Pin or Password. It provides a Safe QR Code reader which safely scans all types of barcodes and QR codes and keeps scan histories which only the user can access.